Carpet may feel cozy under your feet, but this seemingly innocuous flooring is hiding some nasty secrets. Over years of wear and tear, mold, mildew, fungus and dust can build up in your carpet’s fabric, carrying bacteria and viruses. And it’s near impossible to remove these unwelcome “guests” by vacuuming. Ditching carpet in favor of hardwood eliminates potential health hazards and replaces your floors with something easier to clean and maintain while adding to your home’s value: hardwood. Today, a wide range of materials and new technologies are making it possible to say goodbye to dirty carpet forever and find hardwood flooring at a lower cost. When you picture hardwood flooring, you probably think of solid hardwood. This classic style is made using solid pieces of wood from species like oak, ash, pine, walnut, hickory and mahogany. Solid wood floors are durable, long-lasting, and easy to clean. In addition to solid hardwood, you can consider engineered hardwood, which is made from multiple layers of wood sandwiched between two layers of solid hardwood. A protective veneer finishes off the top. Engineered boards can tolerate more moisture than solid hardwood, but you do sacrifice some durability. Unlike solid wood, engineered floors can’t be refinished to remove damage, so you have to be careful to maintain the surface. Don’t confuse engineered wood with laminate flooring. Laminate is a cheaper option that mimics the appearance of hardwood but doesn’t actually contain hardwood. It’s created from layers of compressed fiberboard covered with a laminated image of wood grain. Although you can get high-quality laminate, it doesn’t match the look and feel of real wood and won’t add value to your home, BuildDirect reports. If you want the look and feel of hardwood but prefer a more sustainable option, you may want to consider bamboo or cork floors. Neither one is a true hardwood, but both are becoming more popular because of the materials are renewable and offer relative comfort when compared to solid wood floors. Bamboo is more moisture-resistant than wood, and cork provides natural insulation. However, because these materials are softer than regular wood, they may be more susceptible to damage. Laminate flooring provides the appearance of wood at the fraction of the cost of real hardwood, ranging from $0.50 to $6 per square foot for materials according to Home Advisor. Engineered wood is more expensive but still cheaper than solid wood in many cases. The cost of solid hardwood floors depends on the species and the grade. The harder and rarer the wood, the more expensive it is. Higher quality also demands a higher price. Sticking with a softer wood and lower grain can help you stay within your budget. Should you decide to go with a bamboo or cork floor instead of a hardwood option, you can expect to pay $2 to $8 per square foot for materials. Bamboo comes with an installation cost of $2 per square foot, and cork can cost less than $1 for the same area, Home Flooring Pros reports. The extensive number of available options and price points can make choosing a hardwood floor seem overwhelming, especially when you try to work out the exact cost of each material while weighing the benefits and drawbacks. 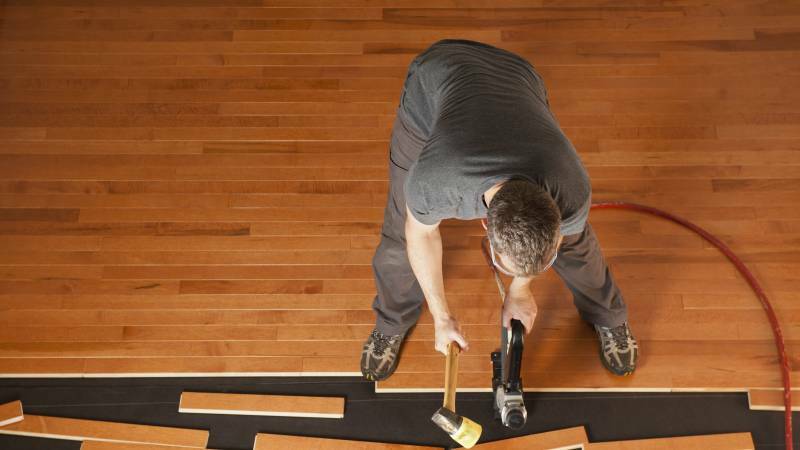 Hiring a professional to install your floor takes the guesswork out of the process. Professional installers have the knowledge and experience to advise you on the best options for the rooms where you want to switch out carpeting in favor of wood flooring. They know how to measure accurately so materials aren’t wasted and can approach the installation in the most efficient way, both for cost and time. It’s easy to find an affordable installer in your area through an internet search. Sites like Yelp, Thumbtack, HomeAdvisor, and Angie’s List have directories of local professionals along with reviews and ratings from previous customers. Read through the reviews and check installation prices to narrow down your options to those within your budget. Keep in mind the cheapest service isn’t always the best, and well-known stores offering installation with your purchase may not provide the best value. Consider all options in light of your budget and the quality of work you desire. This will help you choose the best value instead of automatically gravitating toward what’s affordable or familiar. What matters is getting the floor you want installed the right way the first time so that it lasts for years or even decades without requiring extensive repairs or replacement. If you’re interested in affordable hardwood flooring for your home, start a search today.